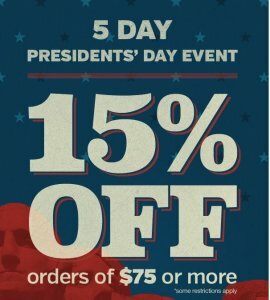 Discount applied in cart with coupon PREZ15. Offer ends 2/17/2015 11:59pm ET. Valid on select items, qualifying items are identified on the product page. Offer not valid on reconditioned, open box or certified items. Discount applies to merchandise only. Excludes tax and shipping. Limit one per customer. Max discount of $200 per customer. Cannot be combined with any other order level discount. No adjustments on previous purchases. Subject to change without notice.